It's really nice during this time of year to reflect on what we're most grateful for in this world. I know, this seems a bit sappy, but so what. Sometimes we need to give thanks to those who support us the most, love us endlessly and put up with all of our sh*t, right? Here it goes. I think anyone who knows me, knows I'm extremely close with my family. I, literally, don't know where I would be without them, always having my back and being my biggest cheerleaders. You all know who you are, I love you. Second, I'm so grateful to have the best friends, near and far. I can't leave out having a beautiful apartment, an awesome roommate and a great job. Ok, I know, that was sappy, but hey, I'm grateful for having the life that I have. I was really excited this year to throw a Friendsgiving feast, my roommate and my first dinner party. My friend put it a funny way, he was like "Friendsgiving, more like Friendsbringing". First of all, he's hilarious and I got a good laugh out of his text, but he really was on to something. We all chipped in to make this dinner happen. It was an awesome effort by all of us to throw this gathering. We all played a part in showing each other how much we were grateful for each other. There were no egos, no drama, just a bunch of friends having a great time together. I was seriously so excited when it came together so smoothly. When you have like 5-6 people in a not-so-large kitchen, you might think things would get a little crowded, like that saying "too many cooks in the kitchen". Not the case at all. Again, everyone pitched in and helped. I was really excited about some of the little details that went into the tablescape. I really wanted to create a table that didn't look like some 20-somethings had just thrown together some paper plates on the table especially since we were using pop-up tables and mix-matched chairs. I mean we're grown ups now. We should have a table that looks more grown up. And yes, that was also a "I'm trying to convince myself of this" statement. I found some plastic cutlery that looked just like real silverware. Also, I didn't used to like mason jars or baby's breath, but I think that dislike has quickly grown into obssesion. 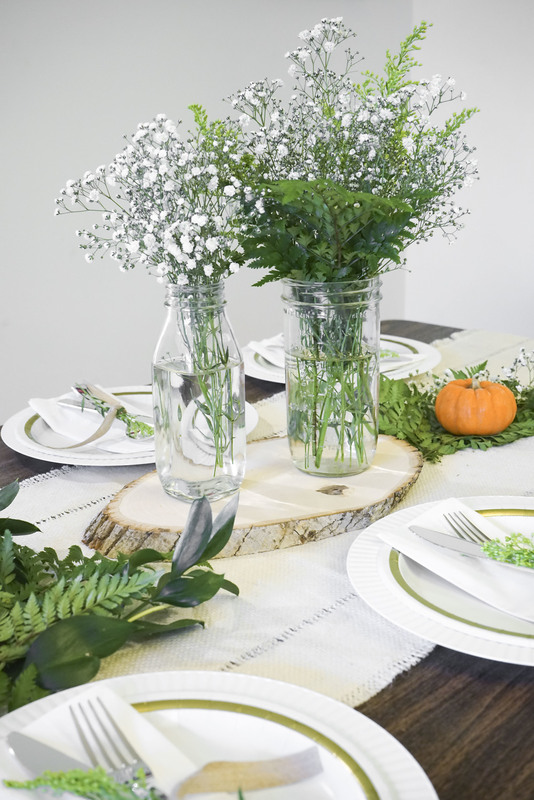 If you haven't had your own Friendsgiving or just need a cute, simplistic way to decorate your dining table, look no further, especially if you have some left over pumpkins from Halloween lying around. Also, if you haven't been to the DTLA Flower Mart, it is quite the experience. A little bit of stimulation overload, but the best kind. And you most undoubtedly will spend way too much on flowers, but really flowers are the best way to brighten up anyones day. If you make it to the Flower Mart, check out my post about it and where to eat after!